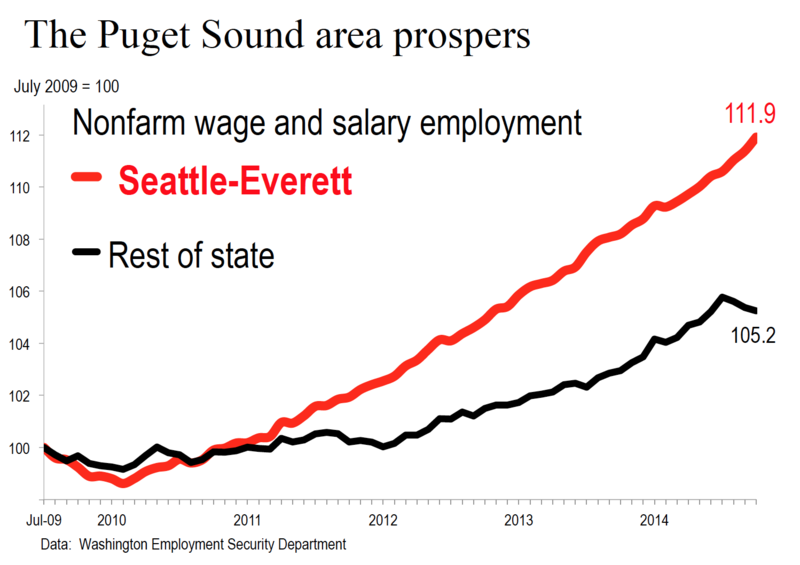 The economy of the Seattle area seems as strong as it has been in my 40 years covering the economy as a financial journalist. Amazon’s voracious demand for office space is remaking downtown Seattle and South Lake Union. The pace is breathtaking, and shows no signs of abating. The company won’t say how many people it employs in the Seattle area. 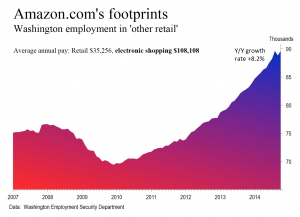 But, as I’ve noted before, you can see Amazon’s footprints in monthly employment data compiled by labor economists. Washington breaks employment in retail trade into eight major categories. They categories include the obvious — auto dealers, grocery stores, home and garden centers, furniture stores, and so on. The eighth category is a catch-all, Other retail. Fifteen years ago, this category accounted for 22% of all employment in retail. Today it accounts for 26%. As the top chart shows, employment in this category, which most likely includes Amazon, has been growing rapidly. 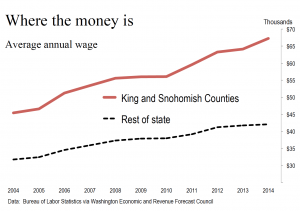 And from the Quarterly Census of Employment and Wages jointly published by the state and the federal Department of Labor, we learn that average pay in a category called “electronic shopping” exceeds $100,000 annually in Washington state, compared with about a third of that for retail generally. 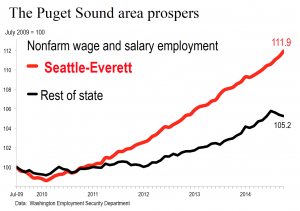 Amazon isn’t the only reason that employment in the Seattle metropolitan area has grown 6.4% more than in the rest of the state since July 2009, the starting point for what has been an extraordinarily tepid recovery from the Great Recession (January 2008-June 2009). But it is certainly a major factor. 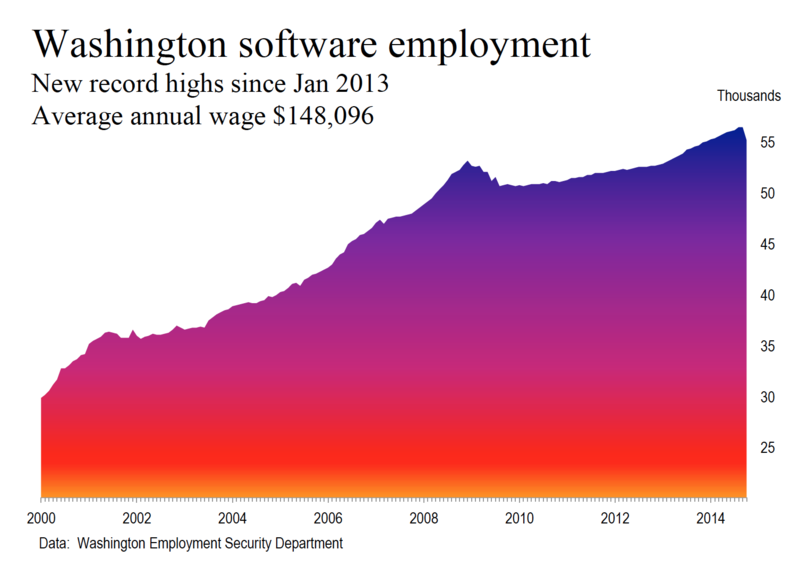 Employment has also been rising in another high-aid sector, software publishing. Modest layoffs at Microsoft have been more than offset by the rush of California-based technology companies to set up shop in the Seattle area, not least to poach talent from Microsoft and others, including Google. Apple and Dropbox are the newest faces in town. Almost unnoticed, reports the New York Times, Seattle has become Ground Zero for the design and management of global data center, effectively the steel mills of today’s digital economy. Think of it this way: Seattle is to the cloud what Detroit was to autos. 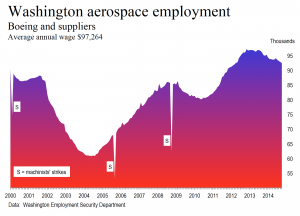 Employment in the Seattle area is declining in the other big and highly paid sector, aerospace. In the past two years, Boeing has decided to shift more than 6,000 white-collar jobs to other areas. If you did no more than skim the headlines, you might get the impression Boeing is leaving town. Don’t judge a book by its cover. The recent employment decline is in factor relatively modest, and starts from a very high level. Boeing employs far more people in Washington than in any other state. That’s not likely to change any time soon. The company is turning out 42 737s a month at Renton. Announced plans will take that rate to 52 by 2018. After winning concessions on pensions from machinists and tax breaks from Washington, Boeing earlier this year made a long-term commitment to the Puget Sound region by deciding to assemble the newest version of the 777 at Everett and also to build the plane’s wing there. Those decisions will keep Everett humming for years. Boeing has about 56% more employees in Washington than it did a decade ago, and about four employees in Washington for every one in California. 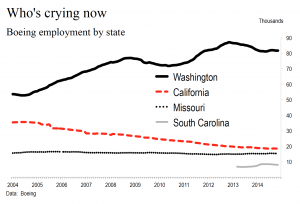 Boeing employment in the Golden State has fallen by roughly half in a decade. 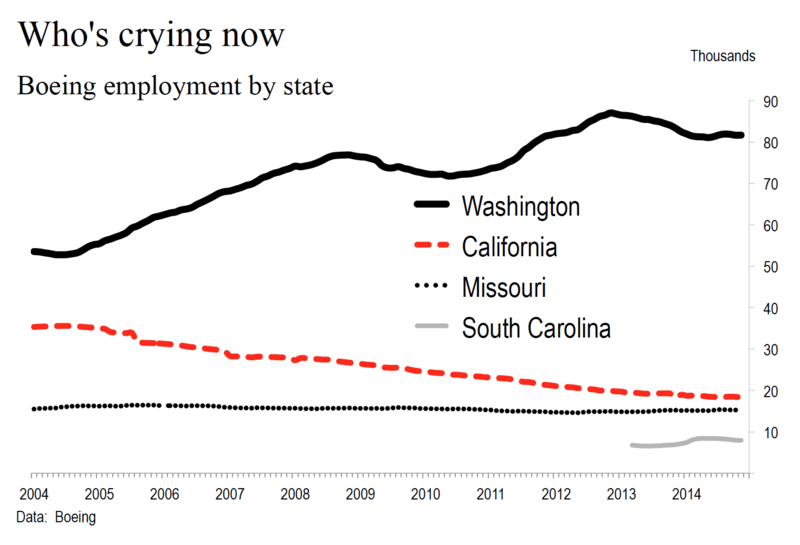 As the chart shows, Boeing employment in Missouri has been static the past 10 years. In South Carolina, the state over which so much ink has been spilled with regard to employment, the company employs about a tenth as many as in Washington State. Prospects for the 777 look brighter than every now that Airbus has finally faced up to the fact that its double-decker A-380, with capacity of more than 500 passengers, was a mistake that is unlikely every to recover its development cost. No one knows what the future holds. If you’ve lived in the Seattle area for more than a few years, you know that the business of commercial airplanes is highly cyclical. The collapse of the price of oil just might be telling us that the global economy is again headed into recession. 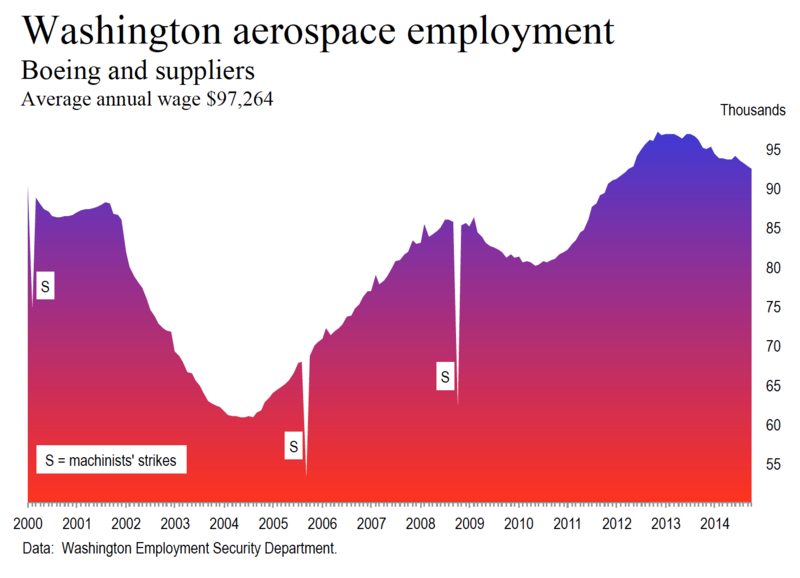 If that’s the case, Boeing’s backlog, now at nearly nine years, is likely to shrink significantly, and with it Washington’s aerospace payrolls. A global recession wouldn’t do Amazon any favors either. My hunch — and it is just that, no more — is that turmoil in markets, including the oil market and stock market, will pass once everyone adjusts to the idea that interest rates will go up in 2015. 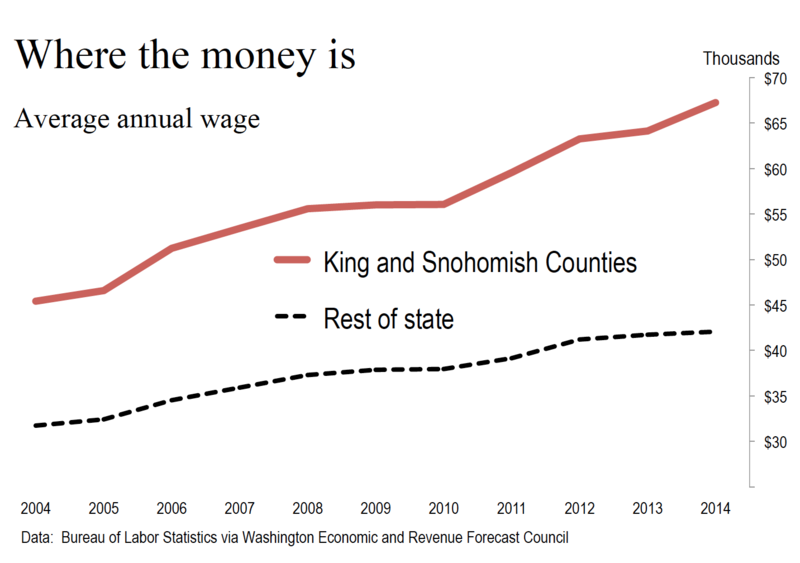 Washington’s economy will be fine, and the Seattle metropolitan area will continue to lead the way. Terrific recap and excellent detective work looking for details about Amazon’s meteoric growth. I’ve worked in the Dexter Ave/Mercer St. corridor since about 1976 and the South Lake Union explosion is has been incredible to experience. It is reshaping downtown Seattle. To think that it all started when the city’s voters turned down The Seattle Commons proposals in 1995 and 1996. That project’s vision of a vast 60-acre civic park framed by high-tech laboratories, condos, bistros, and tree-lined promenades offered an exciting blueprint for transforming a rundown hodgepodge of working-class houses and businesses into a gleaming “urban village.” At least part of that vision has been created, minus the beautiful civic park running from downtown Seattle to Lake Union. Keep up the great commentary.